As you build a warehouse from scratch, modify your existing operations, or replace a pallet rack in your shop, you can rely on Dakota Storage Products to be your one-stop shop for pallet racking systems and material handling equipment. We are ready to assist you in planning, designing, ordering, and installing your storage systems to help get your company operating efficiently. We have decades of experience working with pallet racking - including drive-in pallet racking, pallet flow rack, push back pallet racks, cantilever racks, and carton flow racks. Dakota Storage Products has been a stocking distributor of Husky products since 1989. 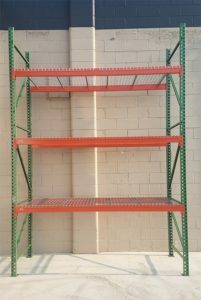 Husky pallet racks are manufactured with prime U.S. made high-strength steel and are RMI certified. The teardrop design is interchangeable with other teardrop style pallet racking. And much more! View our online catalog!